See a map. 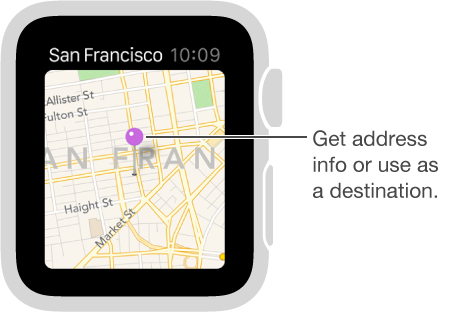 Open the Maps app on Apple Watch. 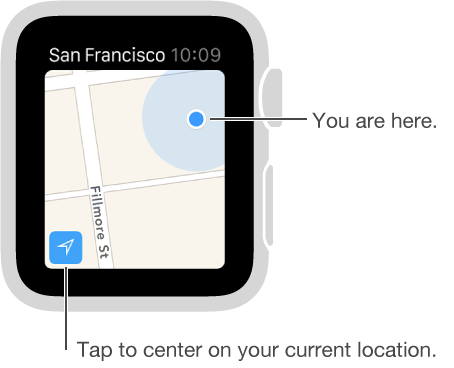 Or, for a quick look at your location, swipe up on your watch face, then swipe to the Maps glance. Tap the Maps glance to open the full Maps app. Pan and zoom. To pan the map, drag with one finger. To zoom in or out, turn the Digital Crown. You can also double-tap the map to zoom in on the spot you tap. Tap the Tracking button in the lower left to get back to your current location. Search the map. While viewing the map, firmly press the display, tap Search, then tap Dictate or tap a location in the list of places you’ve explored recently. Get info about a landmark or marked location. Tap the location marker on the map, then turn the Digital Crown to scroll the information. Tap < in the upper left to return to the map. Stick a pin. Touch and hold the map where you want the pin to go, wait for the pin to drop, then let go. Now you can tap the pin for address information, or use it as the destination for directions. To move the pin, just drop a new one in the new location. Find the approximate address of any spot on the map. Drop a pin on the location, then tap the pin to see address info. Call a location. Tap the phone number in the location info. To switch to iPhone, swipe up on the Phone icon in the lower-left corner of the Lock screen, then tap the green bar at the top of the screen. See a contact’s address on the map. While viewing the map, firmly press the display, tap Contacts, turn the Digital Crown to scroll, then tap the contact. See your current location and surroundings. Open Maps , then tap the current location arrow in the lower left. Or swipe to the Maps glance, which always shows where you are. If you have an upcoming calendar event, the Maps glance shows directions to it.